Quince - Sfargal Bishmezzine is known for it's best Sfargal. REQUIRES MOIST, DEEP SOIL AND SUN. 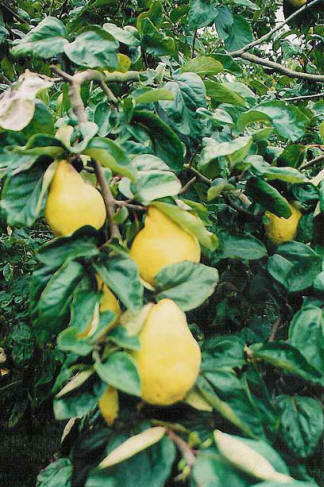 Quince, belonging to the same family as apples and pears, is regarded as their distant relative. The fruit is native to the warm-temperate areas of southwest Asia, in the Caucasus region. Quince is very much like pear in shape and has golden-yellowish outer-layer, when mature. Though it is also grown in the United States, the Asian variety is softer and much juicier. Apart from being eaten raw, quinces are commonly made into preserves and jellies also. In the following lines, we will provide you with information on the health and nutrition benefits of eating quinces. Being rich in dietary fiber, quince is good for the people who are trying to lose weight. Quince boasts of antioxidant properties, which helps the body fight against free radicals and reduces the risk of cancer. Researches have revealed that quinces might be rich in various anti-viral properties. Consumption of quince has been found to be beneficial for people suffering from gastric ulcer. It is believed that eating quince is good for maintaining the optimum health of an individual. Regular consumption of quince not only aids in digestion, but also helps lower cholesterol. The presence of potassium in quince helps in the lowering of high blood pressure. Vitamin C present in quince helps reduce the risk of heart disease in individuals. Copyright© 2005- 2009 Bishmezzine.com interactive. All rights reserved.